The United Nations special rapporteur for human rights in Iran says the Islamic republic continues to execute hundreds of people each year, and conditions are worsening in the country for religious and ethnic minorities, women and homosexuals. Ahmad Shaheed said Monday during a presentation to journalists and diplomats in New York that more than 300 people have been recorded executed in the first eight months of this year in Iran. But he said the true number is probably higher because Iran restricts the availability of information on executions. Shaheed reported 670 executions in 2011 in Iran, which has the world's highest per capita use of the death penalty. The rapporteur also said Monday that members of the Baha'i community are the most persecuted religious minority in Iran. Shaheed is due later this week formally present his annual report on Iran to the UN General Assembly's human rights committee. 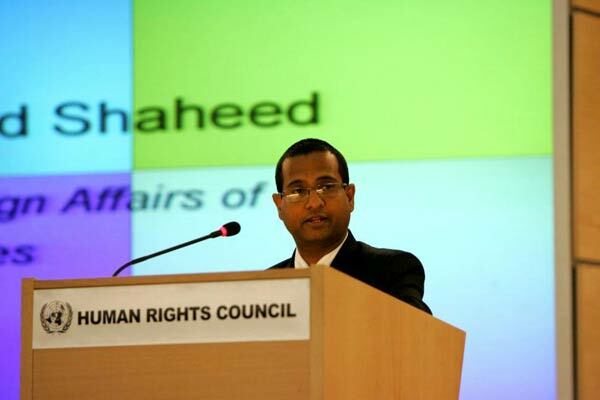 Shaheed, a former foreign minister of the Indian Ocean islands nation of Maldives, took up his post as investigator in June, 2011. He has not been able to visit Iran. He told the meeting Monday that his research indicates the human rights situation in Iran has "become worse" since he took up the post. "Regrettably yes, I am concerned that I have not noticed any significant improvement in the human rights situation in Iran," Shaheed said. "If anything, things have become worse. Reports of torture continue." He said the international community's concern about Iran is justified because the Iranian government "seriously struggles to comply with its international and national obligations" on rights. "Some 240 interviews have been conducted with individuals that reported the violation of their human rights or the rights of others since I began my work mid-last year," Shaheed said. "The reports and testimonies relayed to me during these interviews demonstrate that the international community's concern is fully warranted. The allegations contained in this report paint a disturbing picture of a government that seriously struggles to comply with its international and national obligations." Shaheed said officially recognized minorities such as Sunni Muslims, Dervishes and Christians face persecution and discrimination. But he said members of the Baha'i faith - which is not a recognized religion in Iran - are the most persecuted religious minority in Iran. Iran's Shi'ite Muslim authorities condemn the Baha'i faith as heretical, because Baha'is consider their 19th Century founder to be part of a line of spiritual messengers including Moses, Buddha, Jesus and Mohammad. "The numbers of Baha'is that are in prison have increased, over 100 at the present time according to the information I have, and they face a whole range of discrimination," Shaheed said. Shaheed last month said more than 300 Christians had been arrested in Iran since mid-2010. He said Monday that Iranian authorities appear to be targeting for persecution people who convert from Islam to Christianity, or who proselytize for Christianity. Shaheed also said international sanctions on Iran over its nuclear program may be hindering ordinary Iranians from trying to exercise their human rights, because people must spend more time trying to acquire the basic necessities for life. UN Secretary-General Ban Ki-moon said last week that the sanctions were having a "significant" impact on the lives of ordinary Iranians.